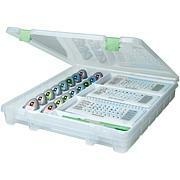 DARICE-Bead Organizer. 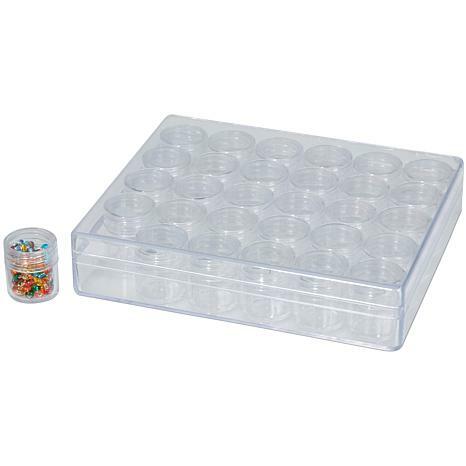 This is the perfect storage solution for all of your tiny beads! There are thirty individual screw top storage jars inside a large square storage container, it makes it easy to keep all of your colors separated. 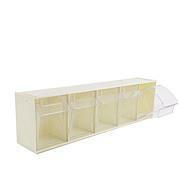 This package contains one 6.3x5.3 clear plastic organizer with thirty 1x1 inch screw top canister. Imported. 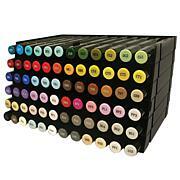 Great for all type small little trinkets & things! Who doesn't understand that these are small when you read the description? If you want bigger jars, order them. I love these. They are very small, yes. But that's what I want. What I like best is they are durable AND clear. I can see at a glance what is inside. I use mine for a number of purposes. 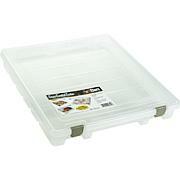 Storing jewelry findings, earrings, etc... I just cut a little bit of anti-tarnish strip and put it in there and it is air tight.Also good for tiny bits of make-up or lotion. I expected the containers to be a little bigger and easy to get beads out of. I found this size to be to small. I will use it for findings.